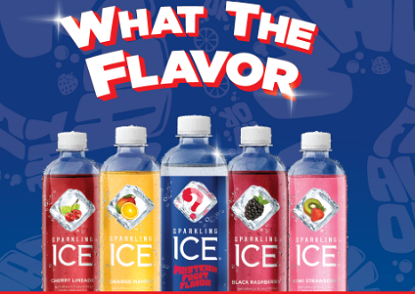 You must guess the flavor of the new Sparkling Ice® mystery fruit flavor, found at retail stores featuring a blue label design during the Sweepstakes Period. NO ANSWER WILL BE JUDGED, as this is a random drawing Sweepstakes. You may, but are not required to, include an optional photo or “selfie” of you or you demonstrating the mystery flavor (i.e. a facial expression demonstrating the flavor) along with your flavor guess in the comment. Entry Method #2 & #3: Instagram and Twitter: You may enter your mystery flavor (on Twitter) or with a comment and photo (on Instagram) however you must include the hashtag #WhatTheFlavorSweeps on both Twitter and Instagram. Instagram: Post an Eligible Entry on Instagram. Your entry must include a photo or “selfie” of you or you demonstrating the mystery flavor (i.e. facial expression representing the flavor) along with your flavor guess in the comment with the hashtag #WhatTheFlavorSweeps. Entry Limit: One (1) entry per person per day. Once you enter a valid entry, it will be carried forward and be eligible for prizes in all remaiing drawings. Roundtrip (coach class) air transportation for two (2) from a major airport nearest the winner’s home address to the prize destination. Four (4) Nights (double occupancy) hotel accommodations. $400 Ground transportation and Expense money. Prize awarded in the form of a check payable to the Winner. ARV of this prize package $8,600 but actual value may vary depending on air flight fluctuations and distance between departure and destination. One (1) First Prize: $500 Bose® Sound System. ARV $500. (20) $200 TicketMaster® Gift Card. ARV $200 ea. Two (2) awarded in each drawing. (30) Sonos® Wireless Speakers. ARV $200 ea. Three (3) awarded in each drawing. (60) One Year FREE Spotify® subscriptions. ARV $120 ea. Six (6) awarded in each drawing. (340) $50 iTunes® Gift Cards. ARV $50 ea. Thirty (34) awarded in each drawing.